Multi-element uncertainty quantification approaches can robustly resolve the high sensitivities caused by discontinuities in parametric space by reducing the polynomial degree locally to a piecewise linear approximation. It is important to extend the higher degree interpolation in the smooth regions up to a thin layer of linear elements that contain the discontinuity to maintain a highly accurate solution. This is achieved here by introducing Essentially Non-Oscillatory (ENO) type stencil selection into the Simplex Stochastic Collocation (SSC) method. For each simplex in the discretization of the parametric space, the stencil with the highest polynomial degree is selected from the set of candidate stencils to construct the local response surface approximation. The application of the resulting SSC–ENO method to a discontinuous test function shows a sharper resolution of the jumps and a higher order approximation of the percentiles near the singularity. SSC–ENO is also applied to a chemical model problem and a shock tube problem to study the impact of uncertainty both on the formation of discontinuities in time and on the location of discontinuities in space. Witteveen, J.A.S, & Iaccarino, G. (2013). 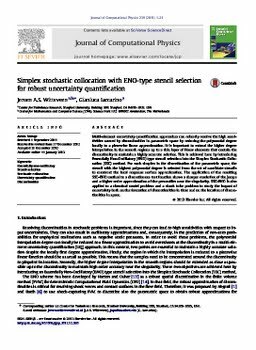 Simplex stochastic collocation with ENO-type stencil selection for robust uncertainty quantification. Journal of Computational Physics, 239, 1–21.